The power pack is self-contained with a built-in battery, AC inverter w 2 AC outlets and control panel all packaged into a wheeled container with handle. 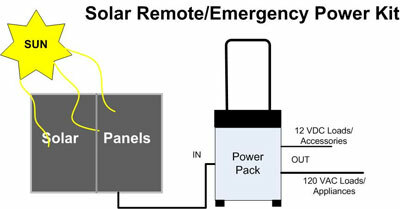 The emergency backup system can power light loads such as: cell phone chargers, TVs, radios, computers, high-efficiency lamps and other 120 VAC items or even used to start your car. The solar panel kit plugs into the Power Pack allowing easy remote charging. Unit includes hook-up wires allowing easy assembly of emergency power system as well as 12V accessory items. Can also be recharged from a standard 120 VAC outlet using included charger. 90W (2 x 45 W) or 130W (2 x 65W) multi-crystalline solar panels mounted on a heavy-duty anodized frame. Various adapters: battery clamps and cigarette lighter that plug right in. The power pack is self-contained with a built-in battery, AC inverter and connection panel all packaged into a wheeled container with handle. The emergency backup system can power light loads such as: cell phone chargers, TVs, radios, computers, high-efficiency lamps and other 120 VAC items or even used to start your car. The solar panel kit plugs into the Power Pack allowing easy remote charging. Unit includes hook-up wires allowing easy assembly of emergency power system as well as 12V accessory items.